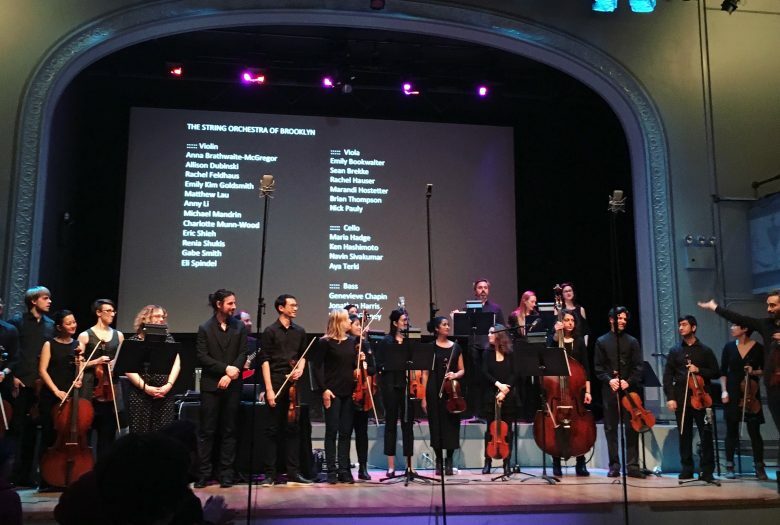 The String Orchestra of Brooklyn returns to Roulette to perform world premieres of newly commissioned works by composers Gregory Spears and Phil Kline alongside Julius Eastman‘s Gay Guerrilla. Phil Kline’s Four Songs from Florida Man features the Grammy-nominated singer Theo Bleckmann; and Gregory Spears’s Concerto for Two Trumpets and Strings features virtuosic trumpeters Brandon Ridenour and Andy Kozar. GRAMMY® nominated jazz singer and new music composer Theo Bleckmann’s diverse recorded work includes albums of Las Vegas standards, Weimar art songs, and popular “bar songs” (all with pianist Fumio Yasuda); a recording of newly-arranged songs by Charles Ives (with jazz/rock collective Kneebody); and his acclaimed Hello Earth—the Music of Kate Bush. Bleckmann has most recently appeared as a special guest on recordings by Ambrose Akinmusire for Blue Note Records and Julia Hülsmann’s trio for ECM Records. In January 2017, ECM has released Bleckmann’s recording with his new Elegy Quintet, produced by legendary label head and founder, Manfred Eicher. Bleckmann has collaborated with musicians, artists, actors and composers, including Ambrose Akinmusire, Laurie Anderson, Uri Caine, Philip Glass, Ann Hamilton, John Hollenbeck, Sheila Jordan, Phil Kline, David Lang, Kirk Nurock, Frances MacDormand, Ben Monder, Michael Tilson Thomas, Kenny Wheeler, John Zorn, the Bang on a Can All-Stars, and, most prominently, Meredith Monk, with whom Bleckmann worked as a core ensemble member for over fifteen years. He has been interviewed by Terry Gross on NPR’s Fresh Air and appeared on the David Letterman show with Laurie Anderson. In 2015, Bleckmann premiered a new work for the American Composers Orchestra at Carnegie Hall, and in 2016 he brings new work to the New York Philharmonic Biennial and the LA Philharmonic. Bleckmann has consistently appeared in the top-five spots in the DownBeat Critics’ Polls for Best Male Vocalist, and top-ten spots in their Readers’ Polls, and his work on Phil Kline’s “Out Cold” helped place that production on WQXR’s Operavore “Best Opera of 2012”. In 2010, Bleckmann received the prestigious JAZZ ECHO award from the Deutsche Phono-Akademie in his native Germany. He is on the faculty at Manhattan School of Music Jazz Arts Program and at Princeton University. A virtuoso trumpeter and composer/arranger, Brandon Ridenour is a winner of the 2014 Concert Artist Guild Victor Elmaleh competition and also an International Trumpet Guild solo competition winner. At age twenty, Brandon became the youngest member of the Canadian Brass, recording ten albums and receiving three Juno Award nominations during his seven years with the ensemble. He has performed concertos with the National Symphony Orchestra, Los Angeles Philharmonic, and the Indianapolis and Edmonton Symphony Orchestras, among many others. A graduate of The Juilliard School, Brandon recently created two chamber ensembles, Founders and Useful Chamber, complementing his frequent international solo engagements in recital and with orchestra. His new album, Come Together, features his arrangements of Beatles songs scored for a diverse array of musicians/instruments, celebrating the 50th anniversary of the song and the importance of humanity coming together. Gregory Spears is a New York-based composer whose music has been called “astonishingly beautiful” (The New York Times), “coolly entrancing” (The New Yorker), and “some of the most beautifully unsettling music to appear in recent memory” (The Boston Globe). In recent seasons he has been commissioned by The Lyric Opera of Chicago, The Cincinnati Opera, Houston Grand Opera, Seraphic Fire, The Crossing, Volti, BMI/Concert Artists Guild, Vocal Arts DC, New York Polyphony, The New York International Piano Competition, and the JACK Quartet among others. Spears’ most recent evening-length opera, Fellow Travelers, written in collaboration with Greg Pierce premiered at Cincinnati Opera in 2016 was seen in the 2017-18 season at the Prototype Festival (NYC), The Lyric Opera of Chicago, and in a new production at Minnesota Opera. The premiere was featured in The New York Times’ Best in Classical Music for 2016, and Cincinnati Opera released a commercial recording in 2017. Spears’ first opera, Paul’s Case, described as a “masterpiece” and a “gem” (New York Observer) with “ravishing music” (The New York Times), was developed by American Opera Projects and premiered by Urban Arias in 2013. Other recent projects include a new song cycle Walden, commissioned by Vocal Arts DC for baritone Brian Mulligan and pianist Timothy Long. He is currently working on a new evening-length opera, Castor and Patience, with U.S. Poet Laureate Tracy K. Smith, commissioned by Cincinnati Opera and scheduled for premiere in 2020. Spears’s music is published exclusively worldwide by Schott Helicon Music Corporation. Phil Kline is a creator of songs, choral and chamber music, orchestra and theater pieces, guitar noise, electronica and sound installations. His early work often used massive numbers of boombox tape players as a medium, most notably in the outdoor Christmas piece Unsilent Night, which is now performed annually in dozens of cities around the world. Other compositions include Zippo Songs and Rumsfeld Songs, The Blue Room and Other Stories for String Quartet, Exquisite Corpses, written for the Bang on a Can All-Stars, the mass John the Revelator and the song cycle-monodrama Out Cold. He is currently working on a chamber opera, Lost in Space, and collaborating with filmmaker Jim Jarmusch on an unclassifiable music theater piece about Nikola Tesla. Gregory Spears’s Concerto for Two Trumpets and Strings is co-commissioned for Brandon Ridenour by the BMI Foundation and Concert Artists Guild.